The results were astonishingly good; seriously tasty and completely worth it. 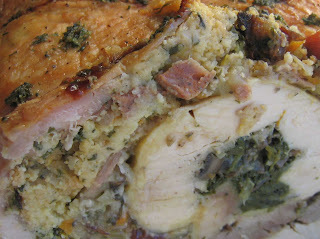 In the post Turducken- Part Deux I explained the process- so in this post I'll just offer the stuffing recipes I created. You could also use these by themselves, should you decide to just roast a simple chicken rather than the meaty breasted beast; in which you will probably want to double the recipes. If you are going to make the stuffings- make them ahead of time and store in the refrigerator (you can't stuff a cold bird with a hot stuffing.) 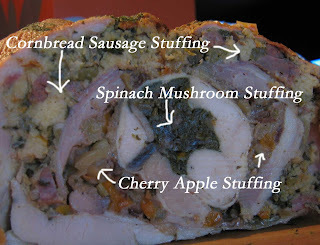 Don't add any bread until just before stuffing. Good Luck! Season with salt and pepper; stuff or bake. Either stuff or bake in oven. You can round this one out with a few extra cups of bread crumbs or croutons and a bit of broth, but it doesn't need it if you are doing the turducken. roughly 1 cup of broth to moisten and bring it all together.